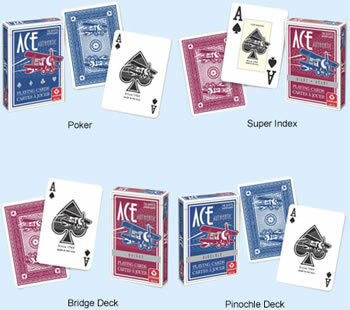 Ace Playing Cards: Cartamundi Ace Playing Cards Avaialble in Pinochle, Giant Index, and More! Cartamundi Ace Playing Cards, Paper - SALE: SAVE 25%! These Cartamundi Playing Cards are among the very best values you'll on the market today. Ace Playing Cards feature a mirror image design of a classic-looking biplane. For more information or volume pricing on Ace Playing Card Decks, please contact us at 1-800-233-0828. SALE – Save on All Styles!